“The Voice” is the Emmy Award winning, number one series on NBC, featuring the country’s best unknown artists and four of the biggest names in music as coaches. We are looking for solo artists and duos that perform all types of music: pop, rock, R&B, hip-hop, alternative, latin, country, blues, indie. We want to know your story and why you are The Voice. 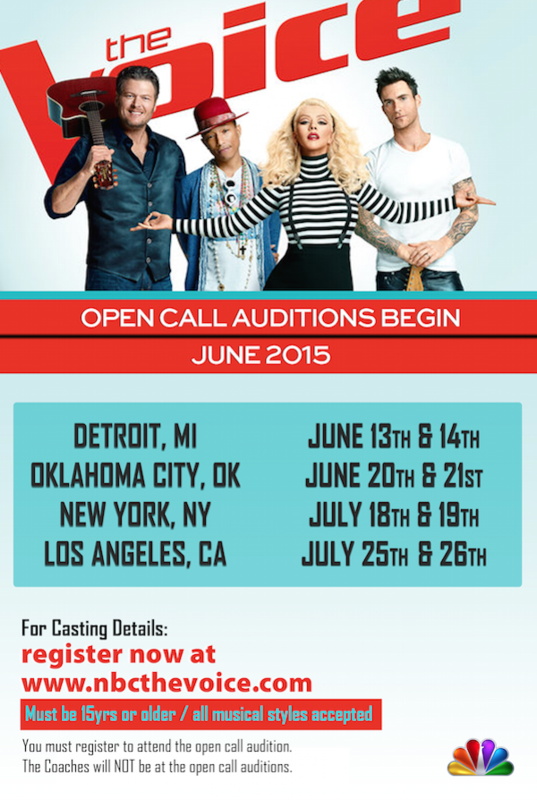 Auditions for “The Voice 2015” will be sweeping the nation again beginning June 2015! To audition you must be legally present in the United States, be 15 years of age or older, and meet all other eligibility requirements. You will receive an Artist Account number and once you’ve confirmed your e-mail address, you’ll be able to customize your Artist Profile and register for an audition city. Once you’ve created your Artist Account, you must select the city you’d like to attend for the Open Call Audition. You will be able to select a city, date, and time group of your choice. Only come to the audition on the day & time you’ve registered for. You may be asked to a callback – please plan accordingly. Please plan to be at the audition all day. We suggest bringing snacks and water. Hi I just registered to audition for the voice today on wed. June 10th I see it saids we are to receive an email to download needed form a week prior! Uhh am I too late ? Lol orr do I still have time to receive it? Thank you for your time! Hello, We were just advertising the link and aren’t involved in the event. I’m sorry I didn’t respond sooner to your comment!